Whew. Well, let me tell you something: I...am...beat. This week has been an incredible flurry of activity, and it's gonna keep going (but in a fun way). The hubs and I are headed to Austin this afternoon for a weekend of celebrations: a baby shower for my sister-in-law and our soon-to-arrive niece; Father's Day; and the hubs's official birthday on Monday (we're going canoeing with his parents). So before I hop on that plane, I wanted to share an easy-peasy dessert from Betty Crocker's Good and Easy Cookbook from 1954. It's so simple and customizable that I can't imagine one of you not liking it (unless you don't like pudding, in which case we just can't be friends...I kid (no, really...). 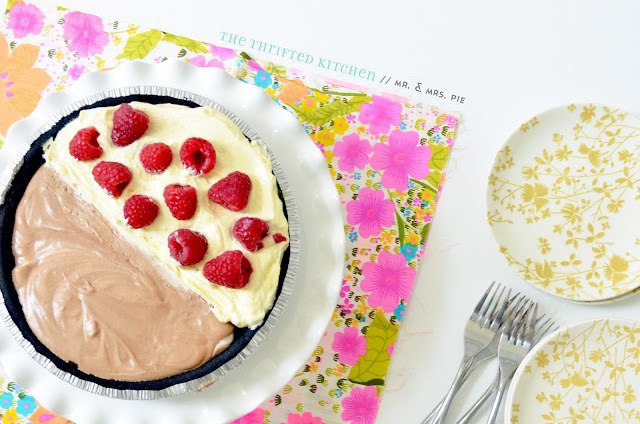 The hubs chose to have lemon pudding pie on his side, which I layered with raspberries according to this recipe from Kraft. On my side was a base of melted chocolate mixed with whipped cream, topped with banana slices, then French vanilla pudding mixed with Nutella and more whipped cream (recipe can be found here). Just half the recipe since you're only making half a pie. To divide it, I used a piece of cardboard from a shipping box, but it left a big gap in the middle, so you might want to try something like a piece of card stock in yours, which is thick enough to stand up, but should leave a much thinner line. 1. 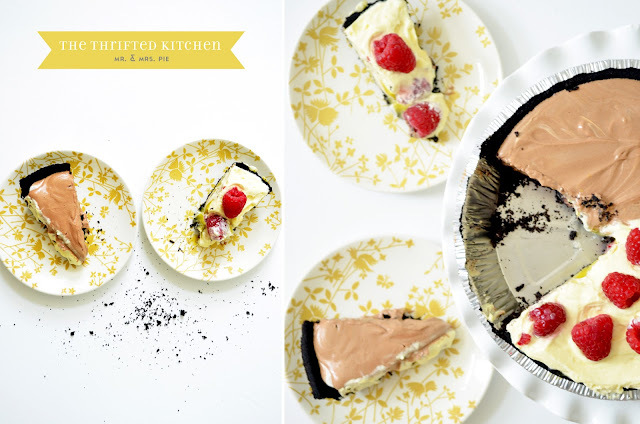 Make your own pie crust or buy your favorite ready-made (I used the Oreo crust). 2. Place a pie of card stock/thing cardboard in the middle of the crust. 3. 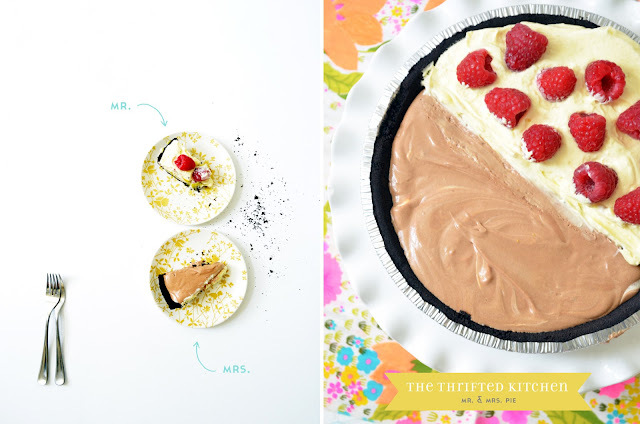 Make half of two of your favorite pudding pie recipes and put each recipe on one side of the card stock. 4. Chill for about 3 hours. 5. Pull the cardboard out and serve! Which flavors do you think you'll try together? Maybe just lemon and vanilla? I like those rasberries, but I bet blackberries on top would be BETTER! And I'm gonna use a graham cracker crust for sure! Yowzas! This is perfect for us. I'm a chocoholic and the hubby prefers more citrusy desserts.